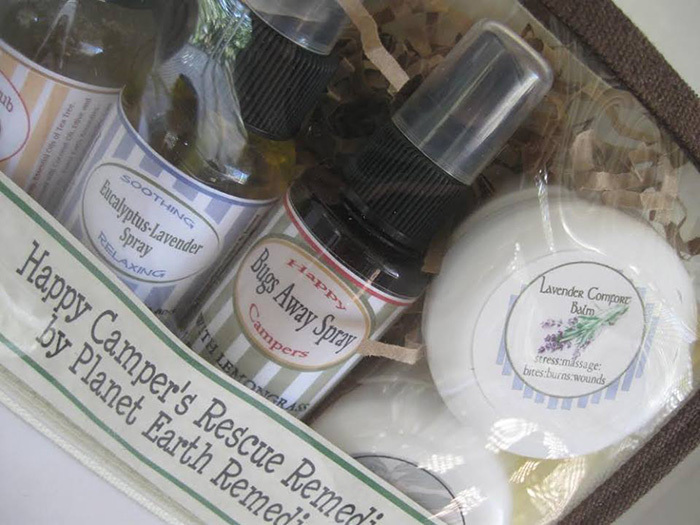 Our “Happy Camper’s Rescue Remedies”tote (not offered on our website) contains natural remedies to get you through many situations where you may run into problems while camping, traveling or even at home. It’s perfect for the summer as many families will be heading out to enjoy camping. It’s a must to have products to deal with emergencies – and especially if the products are pure and natural. These products are all airline compliant sizes. With a $65 value our introductory price is just $55.00 – includes a second bottle of our very popular Lemongrass bug spray, which brings the actual value up to $73.00. 3 ounce Honey Scrub Face Wash: wound healing, disinfectant, antiseptic, anti-bacterial and is essential for cleaning wounds, bug bites and a great product for a face and body wash (I add a little to my shampoo, especially in hot weather). You can also use on your pets for wound healing. It’s the first product I apply when I’ve got a cut or wound – even over peroxide. 3 ounce Eucalyptus-Lavender Spray: invaluable for pain and breathing ailments, but also beneficial for migraines, headaches, bug bites. For headaches apply under the nose area and massage into neck area. For breathing and stress related issues, spray a cotton ball and hold tight to nose area – inhale deep and then exhale. I use this spray daily on myself as well as have had amazing results with my animals, including respiratory issues with my cats. 2.3 ounce Happy Camper’s Bugs Away Spray: don’t forget we are including an extra 2.3 ounce bottle. Bugs hate every ingredients that’s in this formula. One of my biggest selling products ever when I was working summer events years ago. Smells great!! 1 ounce Lavender Comfort Balm: bites, burns, wound healing, stress, headaches, migraines. A staple in my life for 18 years, dealing with TMJ and teeth grinding It’s a lovely smelling blend and use at bedtime to relax and sleep tight. You can also use this balm on your dog’s ear tips (massage in) to help anxiety from fireworks, which are awful. Enters the bloodstream within seconds. Dogs freak out and end up jumping fences – so remember this tip. 2 ounce Tea Tree Bacteria Buster Balm: our very best product for healing skin ailments, itching, sores, bites, dry skin, eczema, psoriasis, pimples, boils, athlete’s foot. As with the Lavender Balm, you can also use this on animals for sores, and itching. If you would like to order, send me a note and I can call you or e-mail me at planetearthremedies@gmail.com. My office number is 520-245-8623 and I usually am working in my office on weekends.